The CareWear light patch produces blue and red light to reduce pain and improve tissue recovery by increasing local blood circulation and elevating tissue temperature. The CareWear light patches emit wavelengths of light that warm tissues to relax muscles, stimulate increased nitric oxide production to improve circulation, decrease inflammation to relieve pain, and stimulate energy production to improve cellular function that facilitates healing and repair. Wearable, wireless, and easy to use, CareWear light patches use revolutionary technology to provide safe, drug-free pain relief that goes with athletes anywhere: use it on the training field, on the bus or plane, even at home. CareWear's wearable light patches are scientifically proven to be safe and effective in helping professional and amateur athletes recover and return to their sport sooner. Recent university research by CareWear has centered on treatment of pain and acute sports injuries using contusion and eccentrically induced tissue damage models on volunteered human subjects. These experiments, carried out with several major universities in the sports science field, are demonstrating significant effects on tissue recovery and pain reduction as compared to placebo controls. 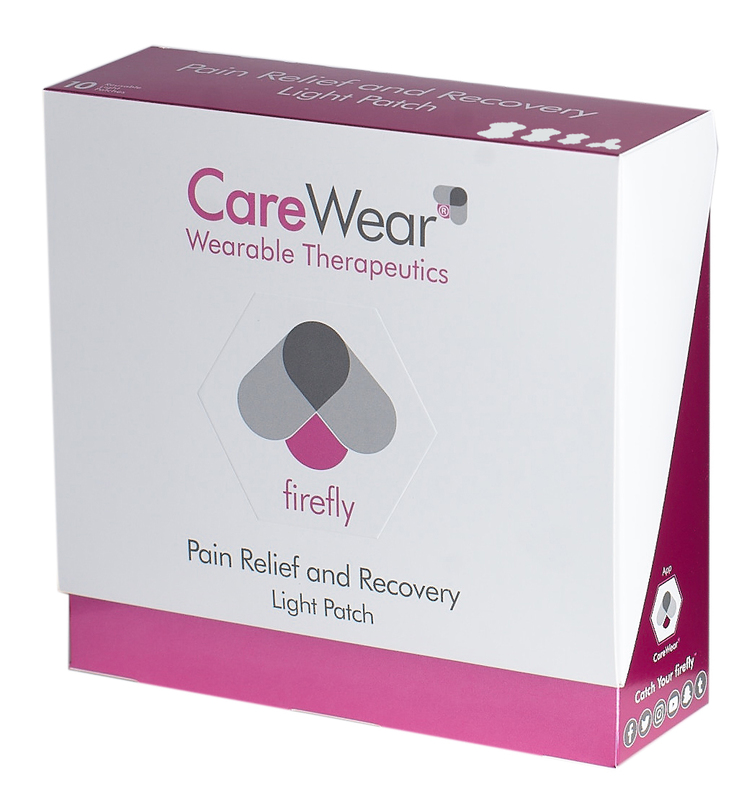 The CareWear light patch features award-winning patented technology using printed LEDs integrated into ultra-slim adhesive hydrogel patches, with over 3500 LEDs per patch. 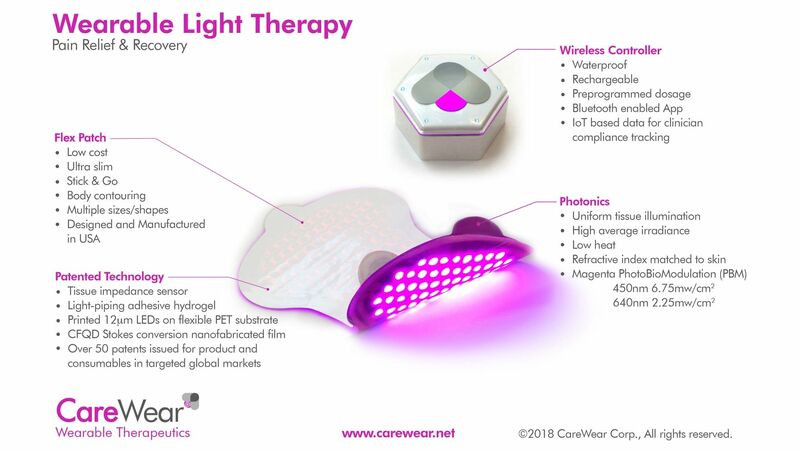 CareWear light patches deliver powerful LED light therapy to treat pain and improve tissue recovery in just 30 minutes. 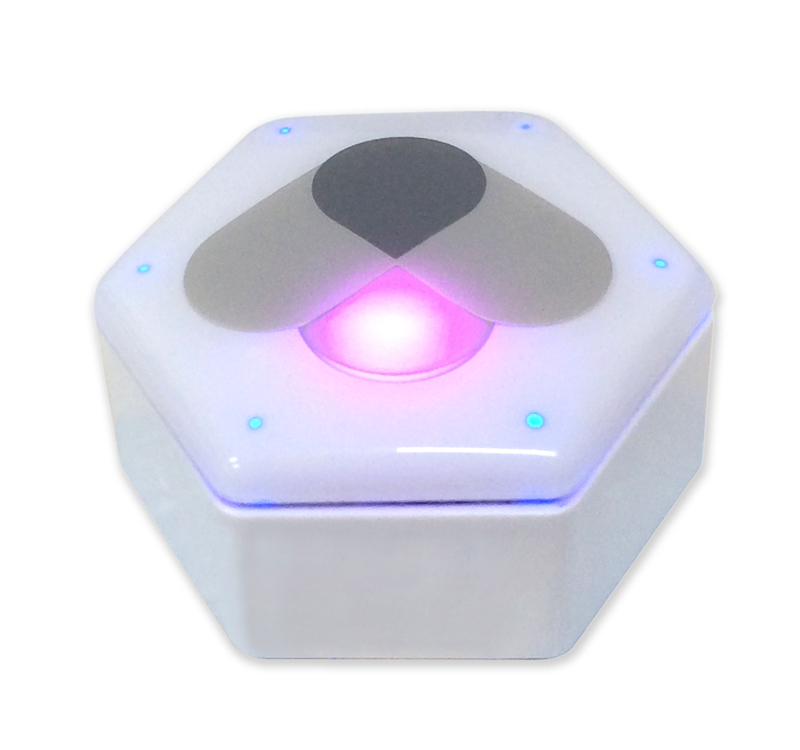 The CareWear wireless controller acts as both power source and dosage control for the CareWear light patches. 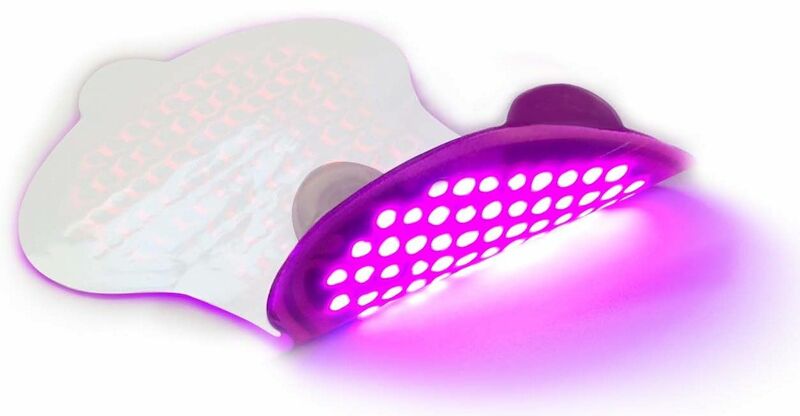 Rechargeable, reusable, and waterproof, the controller is pre-programmed to deliver the correct dosage of light therapy to every CareWear light patch. CareWear Replacement Light Patches are available in several body-contouring shapes and sizes. Each box contains 10 patches which, with proper care, may be re-used up to 20 times each. The CareWear wearable light system is available in two convenient kits for easy use by trainers, athletes, and teams on the go: a single kit with 1 controller, charger, and carrying case; and a “quad” kit with 4 controllers, 4-port charger, and carrying case.